What does Right First Time (RFT) Mean? Right First Time is lean tools that mean doing the thing right in the first time which can remove eliminate or repair and defects producing in garments manufacturing. RFT percent is one of the key performance indicator tools in Garments quality control. In this article, we will discuss What is RFT, RFT Factors and Calculation in Apparel Industry. For example, If 200 pcs Garments is produced in the sewing section, found 13 pcs defect by QC then first pass quantity is =(200-13)= 187 pcs. There may have others area you need to count RFT, I am giving here what I know. 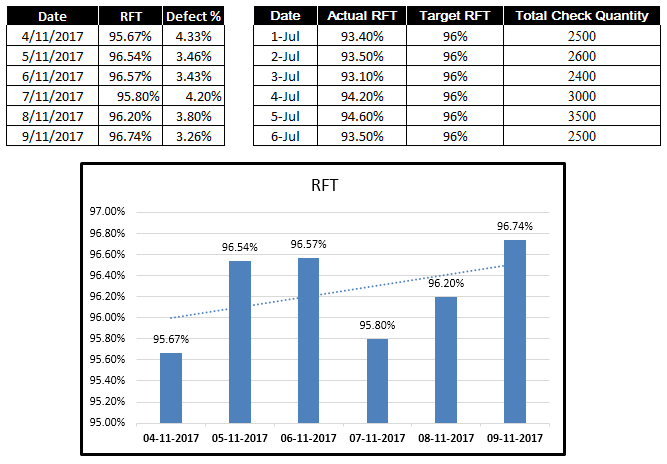 Surely RFT is a performance measuring tool of quality control.